Because of the shape of the harbor, ships calling at Nassau in the Bahamas must execute a 180 degree turn. Some ships do it when they are leaving - - they pull away from the berth and then turn 180 degrees in order to exit the harbor. However, most ships make the turn shortly after entering the harbor and then back into the berth. Either way, this so-called "Nassau Spin" offers the spectator a great view of the ship since it can be seen from a variety of angles as the ship carries out this maneuver. 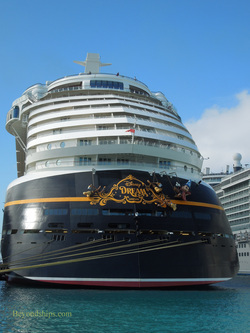 In this video, we see Disney Dream doing the Nassau Spin.